Posted June 17, 2013 by Josette Farrell in Sport. 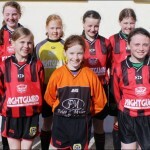 Back L-R: Rhiann Heery, Sinead Donovan (C), Clodagh Grealish, Sinead Murray, Niamh McGrath. 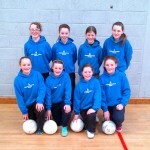 Front L-R: Medb McCarthy, Rosin McCarthy, Rosanna Martyn, Emma Slevin, Kate Slevin, Chellene Trill. Missing from photo: Leanne Frawley. 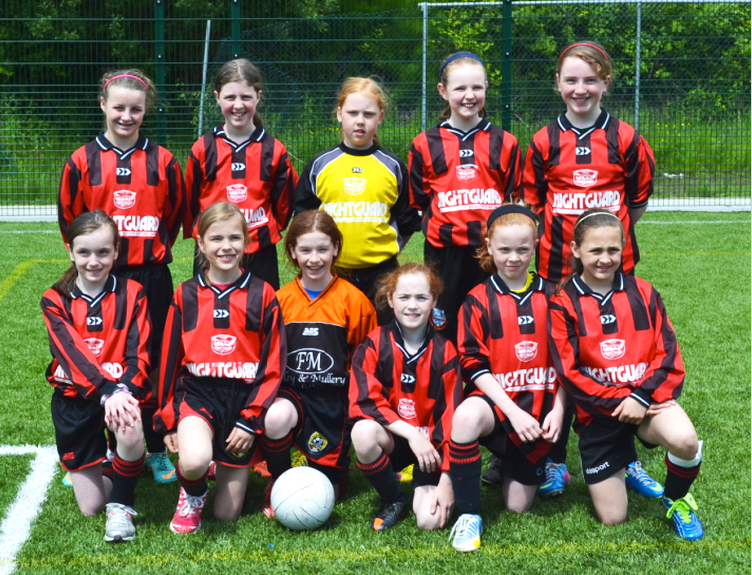 On Saturday 15th June 2013, our Community Games U12 Girls Soccer team travelled to a sunny Drumshambo in County Leitrim to compete in the Community Games Connaught finals. The competition consisted of 2 semi-finals with winners of each progressing to a final. First up was Galway vs Mayo (Breaffy). The first semi final was a 7 nil victory for Galway with an outstanding performance from each player, unusually played on an astro-pitch due to a venue change. 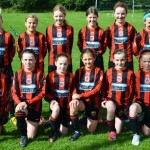 The change of surface had little change to performance with a staunch defence from goalkeepers Rosanna Martyn and Clodagh Grealish and defenders, Niamh McGrath, Sinead Murray and Medb McCarthy. 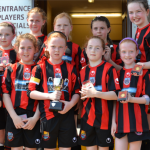 Goals from Kate Slevin, Emma Slevin, Chellene Trill, Sinead Donovan, Rhiann Heery and a super strike from Roisin McCarthy with Galway progressing to the final of competition. Opponents in Final were to be the Roscommon team Knockcroghery/St.John’s, last year’s winners, who defeated Sligo team St. Feichin’s by 4 goals to 1 in second semi final. In the final, a first half where all players were committed to playing attractive and high intensity football, chances were few due to super defending and a nil all score at half-time was a testament to both teams who had clearly upped their games and were providing a very entertaining game for all present. At beginning if second half, Claregalway/Lackagh were making the better chances. A corner 5 minutes after restart resulted in first goal. 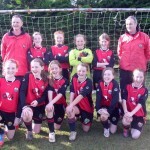 The corner was sent in at speed by Rhiann Heery and appeared to touch off a defender and into net for a deserved lead. As the half progressed both teams had few chances and with about 10 minutes left, a shot rebounded from the Roscommon goalpost and Chellene Trill let fly with a shot to the back of the net. 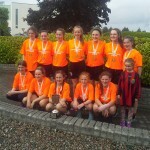 The game finished with a 2 nil result to new Connaught Champions, Claregalway/Lackagh. Knockcroghery/St.Johns was very worthy opponent and gracious in defeat, a very admirable team to have played. With All-Irelands in August to look forward to, each player contributed and shared in success of team. It is our thanks to all parents, families, supporters who came a long way to cheer us on in both games. Many thanks also to the Claregalway/Lackagh Community Games committee for all their support. These players are a credit to our community. Roll on August!